Tags: Antique Print, Asia, Bali, Indonesia. A very fine early to mid-20th century crayon and charcoal etching of a Balinese temple in Denpasar by the famous Dutch artist W.G. Hofker. Hofker, a student at the Academy of Fine Arts in Amsterdam, carried out a number of monumental decorative assignments during the 1920s, amongst others for the Koninklijke Nederlandsche Stoomvaart Maatschappij (KNSM) for whom he made a few mural paintings on ships. His reputation as a portrait painter was such that he received the assignment in 1936 to paint a portrait of Queen Wilhemina for the head office of the Koninklijke Pakketvaart Maatschappi (KPM), the Royal Packet Navigation Company in Batavia. In 1938 the couple accompanied the painting to the Dutch East Indies and concluded with a trip through the archipelago, ending up in Bali. During this trip they made drawings and paintings of Indonesian subjects that could be reproduced and used by the KPM. The Hofkers socialized with many painters, including Spies, Strasser, Meyer and their good friend Rudolf Bonnet. 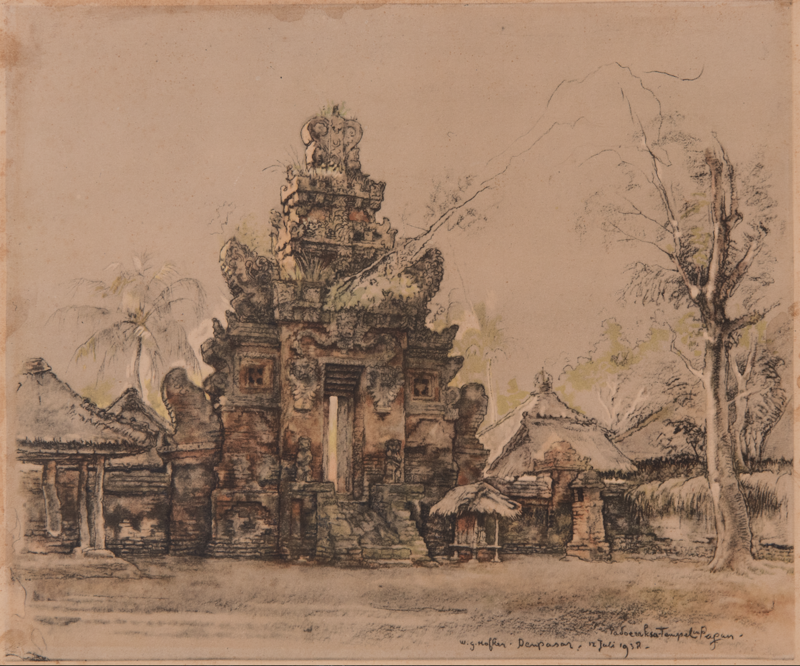 In 1940 the couple moved to Ubud and today, many of his paintings are exhibited in the ARMA and the Neka Museum in Ubud.